So many of us discount Blackberry these days thinking they have fallen so far behind in the smartphone game they might never be able to catch up. The Blackberry 9780, launching today is a lot more evolutionary than revolutionary but perhaps the old adages “if it isn’t broke don’t fix it” applies well. The Blackberry 9700, predecessor to the 9700 was a rock, just an ultra reliable smartphone following the typical Blackberry mold. Blackberry may not be at the top of the heap anymore in terms of design or aesthetics but you can’t discount what they do, they do very very well. Just wanted to comment on the new website look – in a word. Like! Like the cleaner interface. Good job! Thank you!! Its still a work in progress but I’m excited about it! so does this mean the Bold 9700 should be receiving an update soon? I have to adopt a “wait and see” attitude about this. I work customer care and can already imagine issues with this. i lost my faith in blackberry, don’t get me wrong, it’s a nice phone,OS and an email powerhouse, but when i switched over to android, i really can’t go backwards, only forward. sorry bold 9780, 256 more of memory won’t make me jump back, keep trying though, you might catch my attention again. I don’t know about the 9700 being “ultra reliable”. In the last 6 months that my wife has had hers it has required replacement twice due to reception issues (read: no cell reception at all), and more commonly requires her to delete entire text threads because it locks up and won’t allow her to read the messages. She has issues with the messaging system of some sort (SMS, Email, and BB Messenger) at least once every couple weeks. Although, I did offer to pick up the 9780 just because I know she loves her Blackberry and wanted to get her something that may be better, but thanks to Angry Birds on my more reliable HD2 running Android, I think I’ve got her convinced to get a G2. If you are having problems with the BBs, try exchanging the sim card. It ususally do the trick. Yup, bigworm, done that. Actually, one night about two months ago she was sitting with her laptop updating her contacts to sync to her phone (she got a wild hair and wanted pictures on there too) and when she went to connect the phone she noticed there was no signal. I then spent the next hour with tech support. I redownloaded and installed the most recent OS update, reset numerous times, and finally he did what I wanted to. He activated the new sim that came with the phone (but never used). Fixed the problem then, but she still has issues with it on a regular basis. Oh, and as of now, her replacement G2 is on the UPS truck and “out for delivery”. Hopefully we can say, “Bye bye BlackBerry”, but she isn’t sure about the touchscreen. I have had 5 Blackberry handsets and liked them all, The 8900 was a great phone. But like the other poster,I can’t imagine buying another after switching to android. My customers are saying the same. HOW COME EVERY TIME THERE’S A NEW MODEL (OF ANY BRAND) THERE’S ALWAYS SOMEBODY (SUCH AS @ Christianjohnson05) THAT ALWAYS WILL BE WAITING FOR THE “NEXT BEST THING” DEVICE….OMG PEOPLE IM SO SICK OF IT!! I love black berry for bbm their style and business look. But bb has ben cheating people. I what the montana aka touch screen bold. I’m sure I’m not the only one. I’m a heavy mobile web user and I had to get rid of the 9700 bcuz of the small screen size boring as hell and lack of touch screen. I called 5 different tmobile stores in my area and none of them have the 9780 yet. I’m in the middle of my 14 day trial…hope the stores get it by the 29th otherwise I’ll be staying with my mytouch4G. If you are going to buy a blackberry, why don’t you just go back into the early 2000’s and buy an old school nokia?? They don’t do much better. The BB OS is from the stone age and all of their phones are basically EXACTLY the same, with a few negligible enhancements through the years! Look at statistics in the market now- any professional market- the majority in every major market is using either Android or iOS. The major complaint used to be lack of power and lack of QWERTY keyboard. So many Android phones have keyboards now and with 1 ghz processors being the new standard, most of them are all fast and reliable if you spend a little time learning how to properly use them! I visited my local T-Mobile this afternoon to get some hands-on tiime with the 9780 and OS 6 but they didn’t have a demo phone nor did they know what the 9780 was. Somebody checked and found a shipment of them in the stock room but they didn’t get one out. Instead they tried to sell me on Android (which I already use). Oh well. I will try a different store. had the same thing happen to me. They had no idea what I was talking about they still have the 9700 out which is discontinue…. It was one of the stores in Overland Park, KS (suburb of KCMO). Believe it or not, the nearby mall is always on top of things. I’ll try them tomorrow. Customers come in all shapes & sizes. Android IS the most popular OS right now BUT for anyone to think that BB is a dying breed, you’re sadly mistaken. 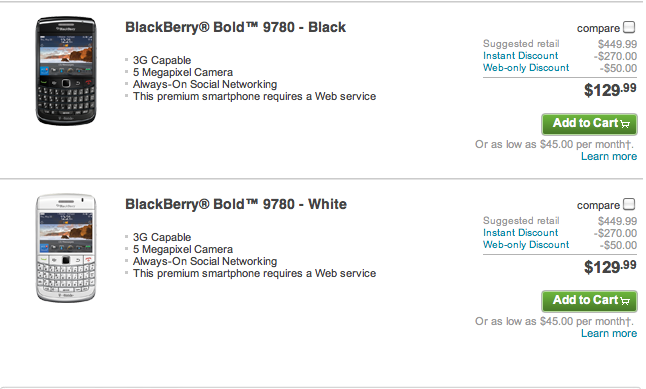 When you look at it, BB’s are a MUCH more reliable device than ANY android device. I friggin love Android but I WILL be the one switching back to the BB 9780 due to 2 things. 2. INCREDIBLE WEB EXPERIENCE- I must have attempted to load over 30 tabs of web in the 6.0 OS & the phone still ran flawless with NO LAG. The webkit is the same as android & Apple OS’s. Because of the fact that I don’t weigh my phone down with numerous apps( I have a G2 now), I will be giving this phone a whirl. The fact that I dont have to worry about how long my phone goes til it dies makes me feel at peace. Trust me, Android is SENSATIONAL & a great fit for majority of customers BUT there are still a HUGE BB family out there & this is a welcome addition to one of the most beautifully crafted devices in this age of cell phones. BB, you still got work to do to catch up BUT you been in the game this long so I have confidence that you ain’t goin ANYWHERE!!!!!! My local TMo store extended my 14 day return period on my wife’s 9700 so I could upgrade her to the 9780. It is a really nice phone, runs faster, has better accessories too. My wife even commented on the speed improvement over the 9700. This is a worthwhile upgrade. So I got the 9780. I happen to be in Jersey visiting family last night and went to the T-Mobile store in the Menlo Park Mall. Nothing beats a blackberry if you ask me. Not available for existing costumers, only for new contracts. I went to a Tmobile store in Coral Gables, Fl, they still dont have this phone.